On Saturday, my family and I attended the Michigan-Michigan State swimming and diving meet at Canham Natatorium on the University of Michigan campus. My wife and I want to expose our daughters to sports that are hard to find on television and that might interest them. Both MSU and U of M have more than 20 varsity sports (and a few high-level club sports). Most of these student-athletes are not household names, and many are not on a full scholarship. Other than football, basketball, and hockey, both schools charge a minimal fee, or no fee at all, for spectators to attend their sporting events. Some student-athletes might have Olympic or professional aspirations, but the remainder push themselves beyond their limits to improve their teams and to discover how much faster they than go, how much higher they can reach, and how much stronger they can be. We arrived at Canham 15 minutes late and were surprised (and happy for the athletes) to find that the stands were nearly packed. We were stuck sitting by the warm-up pool, but we were still able to see all of the action, except the diving was a little bit too far from us to really enjoy it. On this day, Michigan was heavily favored to win the meet. Michigan men's swimming and diving team has won 19 team national championships, more than any other university, and its women's team is often a top 5 or 10 team. Michigan has placed at least one swimmer in every Olympics that the United States has attended since 1928. Michigan State's swimming programs are not as storied as Michigan's, with no team national championships and only a handful of Olympians, and they were heavy underdogs on this day. An upset over Michigan would have been historic for MSU, but the Spartans did not make history on this day. 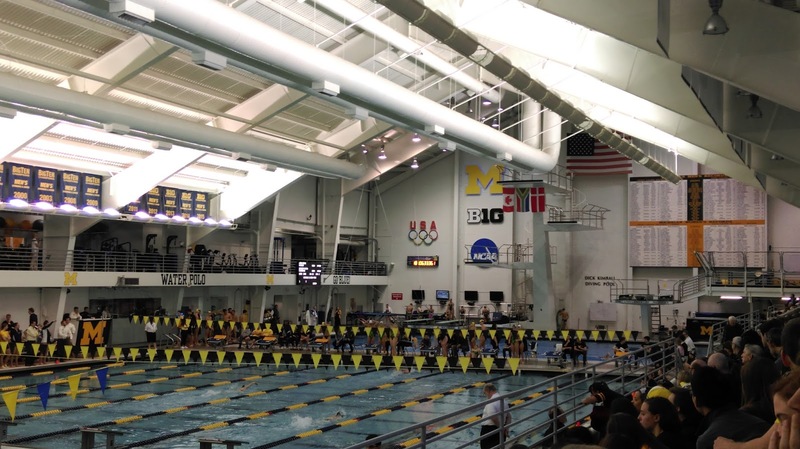 Michigan won every swimming event, but MSU did win two of the diving events. Despite the lopsided results, MSU did have some strong swims, including exciting races in the 50-yard men's breaststroke and the men's 200-yard freestyle relay races. 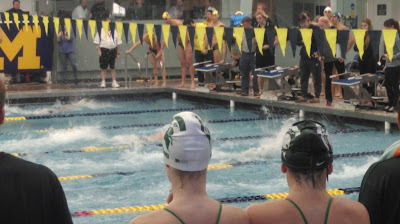 In both races,the MSU swimmers pushed U of M's swimmers but came up just short, finishing second. Canham is a great environment for families with young kids. 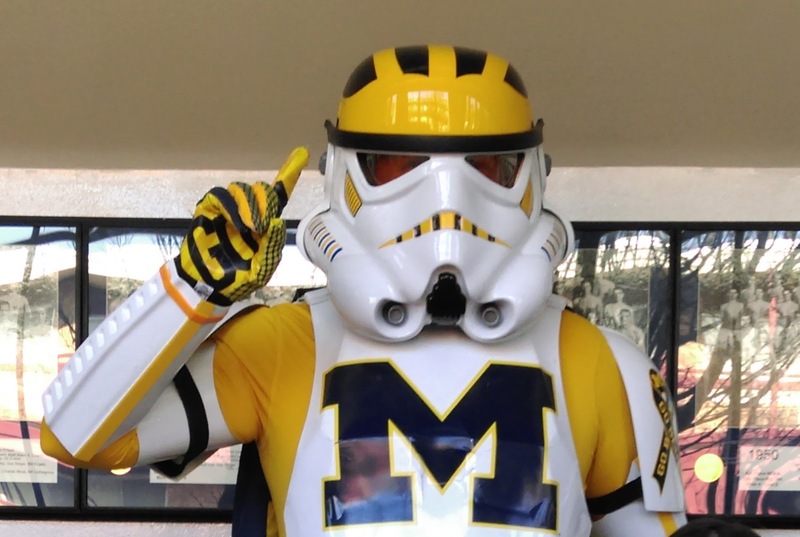 Except for the few close races, the environment was more laid back than any football game between the schools, but fans still cheered and shouted, "Go Blue!" or "Go Green! Go White!" With most of the races being only a couple of minutes long, the swimming competitions are great for kids with short attention spans. Our daughters could miss a race or two and not miss out on the overall experience. Plus, I didn't have to explain everything that was going on, since the only explanation needed is "the fastest swimmer wins the race." They were able to see athletes who have dedicated their college years to competing at a high level. Even in our seats, we witnessed the passion the athletes from both schools have for their teams as they enthusiastically cheered for all of their fellow swimmers racing in the pool, even those who came in last. 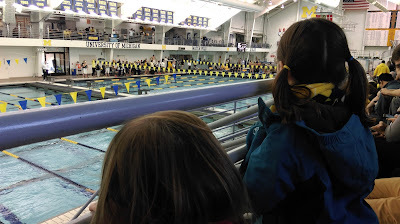 At the end of the meet, our 7-year-old daughter got a free poster of the Michigan swimming and diving team and was excited to get autographs from a few of the Michigan swimmers. Our daughters even met the Wolverines Trooper, a fan who dresses up in a Michigan-themed stormtrooper costume and attends various Michigan sporting events, and who seems like he is a genuinely good person. This was a huge deal to our girls because they have fallen in love with the Star Wars movies. Our family had a great time seeing incredible athletes competing at a high level. We are looking forward to attending more events for non-revenue sports and supporting athletes who spend countless hours training to make themselves and their teams better. And, in this case, Go Green and White too.